The tarmac ball court in Norwood Park , by Elder Road, is due to get an upgrade to astroturf. An artificial grass surface means the ball court can be used as a pitch for competitive junior and adult football matches and training for other sports. The council has set aside £150k to invest in sport facilities in Norwood Park. Following talks with the Football Association, Friends of Norwood Park, The Norwood School and local community sports clubs there are 2 alternative options. One option is for a junior sized pitch 97.4m x 52m and the other for a full sized pitch 106m x 70m. A meeting on Monday 1st June at 6:30pm at Norwood School, Crown Dale SE19 3NY will review the 2 options. Come along to find out more about the project. This is hardly an eco-friendly choice. Surely there must be a better option, such as sand? I’ve been using this area to ride ever since it was turned tarmac. No one uses this area as much as I do. Leave it as it is. It’s a multi purpose area. Not all of us want to play football. The tarmac ball court in Norwood Park has been used by the Flatland sport community from the very beginning and it is known world wide within that community. I do not believe that the plans to replace existing surface of the court to astroturf will win council any favours, in fact it will take away not only the place of joy from countless people devoted to the sport but also from local children that enjoy playing tennis, frisby, football with there parents. Please don’t take away what has become a place to be for many flatlanders visiting London. TGM (The Green Mile) is not only a place to ride it is a place to enjoy sport that means a lot riders and there families. Thank You. Norwood Park is used for many reasons such as 1WM BMX, not only they do Jam events but workshops as well as projects. You can’t just take their hard work away from them this is not just their training ground it’s their home. By astroturfing the area, you are preventing the area from being used by other local residents for other sports and hobbies. It will sit neglected for many days of the week and become a dog toilet. What about the kids wanting to.ride their shooters, their bikes, the basketball kids, the team of bmx riders – they all use the facility and add diversity to Norwood. This plan to astroturf is a ridiculous one and a waste of money. It should be an area for ALL residents, not just a handful. The footballers can use the current tarmac – why astroturf the whole area? The Norwood park concrete area is known worldwide as a Mecca for flatland bmx riders. I and my friends from East Anglia regularly travel there for events put on by the TGM riders who use it as their local spot to ride. Our sport can make it difficult to find large areas suitable for such gatherings and they draw riders from all over the world, I’ve personally made friends with guys from France,China,Russia,Hungary and Australia to name a few on my visits there. As to ball games being played there,in my experience there are a comparatively very small amount, when balanced against the amount of riders who use this area and feel it would be a tragedy for it to be astro turfed. Especially as it is not even guaranteed that it would get sufficient use to justify the high monetary outlay. Flatland bmx’ers often suffer prejudice when riding suitable spots flat enough for our art form, as it is often only places Where there is security who quickly ask us to leave, ie outside offices and indoor carparks. The dedication of Flatland bmx riders must also be mentioned, as often it can take days,weeks and even months to attain certain tricks. That is in large part why this area is so important to our community, as it is a safe zone Where the suitable time needed can be utilized to that end without the constant irritation of being moved on by security guards. I appreciate that many who read this do not know,or understand What Flatland bmx is,so would encourage them to follow this link to get a better understanding of why Norwood courts is so important to our sport/art form. This floor space is frequently used as a training ground by a group of pro-active trick cyclists (BMX flatland riders). The space is referred to as ‘The green mile’ (TGM) a reference to the beneficial large floor space. TGM is a valuable area for this type of BMX training. Public floors for this sort of bicycle riding are suprisingly difficult to find. It would be fantastic to see third hard floor option introduced so the space can continue to be used by everyone. We had a Tarmac pitch in castle haven rd ,Camden town which had goals and basketball hoops.it was free and all sorts of people could use it I.e people learning to ride bikes,skateboarders ,basketball players,footballers even a solitary bmx rider !now it is plastic locked up when not used and only for football . The tarmac ball court in Norwood Park is known by thousands of people around the world by another name – The Green Mile. It is home to the UK’s largest representation of BMX Flatland riders and the beating heart of UK Flatland. BMX Flatland is a creative sport and a progressive artform which demands years of humble dedication to learn; the end product can be breathtaking. Despite their modest appearance, some riders who train at The Green Mile have competed all over the world and have brought home World Championship titles. Some have been coached and supported from an early age. I implore you to include this community as primary stakeholders in any project that would affect the court in Norwood Park. Their achievements should be celebrated and they have earned the right to be heard. While their requirements are not substantial – they need flat tarmac – I would warn you against assuming that there is somewhere else for them to go with their bikes. Trust me, we’ve looked and there isn’t. Please don’t astroturf Norwood Park. This has become a great recreational area for flatland BMX riders who are willing to help kids learn tricks on their bikes. It would be a massive shame for this area to be taken away from them and what they hold so dear to themselves and the community. Plz do not astro turf this place, it has loads of history within the BMX community. I’m from the United States, and have swore I will make the trek one day to come ride with the riders of the green mile. So now this area will only be accessible to people who play football??? Surely the area is for everyone to use not just footballers who already have a multitude of facilities to use. I don’t play football but wish to use the area as it is. Ridiculous idea and bias to football. If the area is being used least by the footballers it doesn’t make sense to AstroTurf. Seems like it just restricts other people from doing there sports. Leave it as it is, football can be played on tarmac unlike scooters, roller skates etc. I really don’t see the need to astroturf the Norwood Park courts. This money could be used to create a new area (if it is burning a hole in your pocket). I have regularly ventured to this place to watch world class, bicycle stunt riders perform some of the most amazing things on their bicycles. All are very friendly and very accepting. A guy who went by the name of Phil used to be world champion apparently. This tiny plot is a haven for these guys. It is their only well surfaced area to perform their tricks and taking that away from them (when there are plenty of suitable pitches etc to play football/tennis) is a travesty. I hope you consider this, as Bmx was such a successful event at the Olympics and bicycle riding is being rigorously encouraged across the country. Do we really need another astroturf pitch? Footballers and tennis players prefer grass and, this bit of land has been used by Bmx trick cyclists for as long as I can recall. In its current state, it is practically maintenance free(bar some lining every now and then). Astroturf needs care and does not last forever. Would it not be wise to assert your efforts in a new scheme? After all, cycling is on the increase, bmx was hugely successful at our Olympics and by taking this away, what do intend to put in place for this very large community who will have their “hobby” area stolen from them? I regularly have seen large groups of bikers in the area, making the most of their “haven”. we all know that people play football as a seasonal thing,so to turn this into fake grass would be a ridiculous and costly process ,maintenance during the winter months alone would cost a fortune especially if it floods.As it stands as tarmac makes the area perfect for multiple sports and seems like you would rather take the needs of the many just to satisfy the wants of the few,the people commenting on this post are begging for you to leave it as it is because we have priceless memories of the area and hope to have many more.we all understand that times and areas change but if you would be good enough to look into what it means to us then hopefully you can understand . This park is world famous, and not for any ball sport. It has produced some of the finest flatland bmx riders the world has seen. Please don’t desecrate what the flatland world considers a Mecca. I have yet to make the pilgrimage myself but I don’t want to lose out on the opportunity. 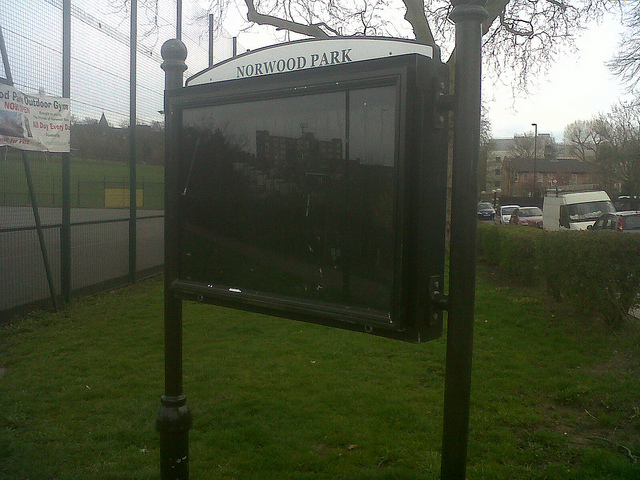 Please reconsider the plan to astroturf Norwood park. It will such a waste if an iconic space if you decide to astroturf such a well used space for footballers, bike riders, longboards, cricket, ironically changing the surface would actually limit the use. If this is about the area getting more multiple use out of the space, you could resurface the floor with a harder compound and set up basketball and netball width ways. Then you would have football, basketball, netball, bmx flatland, longboards, cricket and way more use of a great social space. Please leave the area, known by many as The Green Mile, free from astro turf. It has served flatland bmx riders from all over the world as a meeting point in Londons capital, as well as a training ground for Londons flatland riders. On my multiple visits I have been met with open arms by people who come from all over the uk and the world. I have seen them co-exist with the other users, many of whom have their eyes opened for the first time to an art form in cycling that receives little in terms of public acclaim, but demands massive dedication from the riders. Not resurfacing this court leaves it open for all to use, where as covering it with astro turf means that it’s use is restricted to a few. With the rebuilding of bloblands, the local council have showed how forward thinking they can be in engaging the local community and giving them what they want. I beg you to please engage with your local community again. There are many, many football pitches. There is only one Green Mile. You not to go ahead with the project, but no one asking you to….. Please consider all the great communities that have grown around this iconic tarmac field. I am a unicyclist who went there once to train, and found a great deal of camaraderie with BMXers and great shared moments. The green Mile should remain a place of diversity and not exclude those who are not footballers. Please can you share with us your research to show us, the members and users of Norwood Park, why you believe astro-turfing such an iconic and versatile space would benefit the community. As an example, if you spent a week documenting the users of that particualr area of the park, you would find the space is used by a miriad of other users than just footballers. As you will have read from the comments mainly BMX riders, who from my first hand knowledge have done a lot more to promote this little corner of London to the world at large. You may have also noticed, that not one footballer has been here on this forum to defend or speak out against your astroturf decision. Use the money to promote West Norwood as a vibrant and culturally interesting borough area of London. London has a lot more things which need to be spent on, and astroturfing an area for no valid reason (unless you have had complaints from footballers about the lack of astroturf in the Norwood area) seems pointless. You may not think of Norwood Park as an international tourist destination, but it is to a worldwide community of Flatland BMX riders. There are only a handful of locations around the world that have the same notoriety and the significance that The Green Mile has to so many riders needs to be taken into consideration with this “upgrade”. When my husband (Paul Chamberlain) and I are in the UK, we always go to Norwood Park on a Sunday, knowing that the local flatland community will be there to meet up with. For the council to turn their back on a large group that has used this area for so many years shows a great ignorance for how the park is actually used by it’s patrons. Local councils in Australia invest millions of dollars into concrete skateparks and they are so widely used that every council is expected to have one. It costs significantly less to build and maintain an area for Flatland BMX – all that is required is flat tarmac! Not every child wants to play football and BMX is particularly popular with younger generations. It’s important to use public space to encourage a diverse range of sporting and outdoor activities. The water play area in Norwood Park is a fantastic step in the right direction and my daughter absolutely loves it. If you are hoping to encourage more people to use the park, it would be outrageous to disregard the flatland community and their families, who make up a good proportion of the park’s current patronage. How about including an area specifically designed for Flatland in the upgrade? You would probably be the first park in the UK to do so, which would add another chapter to the long-running history that Flatland BMX has with Norwood Park and no doubt attract even more international visitors. The council are simply thinking about bringing fame to the area in the form of a soccer facility that could host important matches. Look at how the area is already used. Phil Dolan rides his BMX bike there and he’s an X Games Gold Medalist. Jason Forde is another famous and well-respected rider who uses this facility more than any soccer player. It’s the Mecca of BMX flatland in the UK. Also, why tar everyone with the same brush. It’s a multipurpose sports area. An entire community can’t enjoy astro turf, but they can potentially use a large open Tarmac area. The council had ‘set aside’ £150’000 to do it? I’d say they should do their job and invest that money in 30 different community projects instead of going for a show piece that residents don’t see themselves using. Why destroy an already existing public community space/facility to the benefit the money minded and the footie few. This space currently serves as a facility for athletes – can’t that be encourages and nurtured as a part of the community and history of BMX. Of interest to support the cause against the plan….???!!!! THE GREEN MILE JAM from 1WMBMX on Vimeo. Yet another ‘Community’ area to be selfishly devoted to the sport of football. Not everybody in the community wants to play football. Some people want to take their children to this space to learn how to ride a bike. Others want run around the perimeter and time their laps. Some want to ride their flatland bikes to amazing levels of skill and dedication. Others want to play football (which they already can on the current surface.) We all have different reasons for visiting this space. As a member of the community, I see absolutely no reason why this space should be exclusive to football. It’s disgusting how the community is getting tossed aside to make a small profit out of land that the community tax payers have a right to use! Please reconsider this ludicrous decision. I was at The Norwood Park first time in 2009 Because of the bmx flatland community, the Green Mile (TGM) is one of the best places to ride in London and just like me, riders from all over the world visit this place every year! It will be a big lost for the sport. West Norwood park or as I know TGM is my favorite bike spot! First time I was there in 2007 and can not wait the next time to be there again! Please leave it as I know it and make possible to visit back there year by year to ride with bmx riders from all around the world!